Little did I know that the beans would arrive with a challenge. Seven bloggers (myself included) had been selected to come up with an innovative and creative recipe and post it by the end of June. I’m not usually a competitive person..but this challenge intrugued me. It was not going to be easy. I had to be creative with beans; varieties I’d never even heard of; by the end June. YIKES! Flageolet Beans: an immature kidney type bean with a versatile flavor. Marrow Beans: egg shaped white beans with a bacon like flavor. Once I got to know the products I spent some time thinking of unique things to do with them. This is when the challenge really began for me. They’re beans after all…how much can you really do with beans? Well I think you might be surprised. I came up with three somewhat uniquely creative recipes that I thought were all pretty darn good. 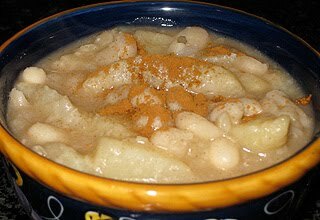 This was inspired by a Lidia Bastianich recipe for bean and apple soup. The soup sounded really interesting to me and since apples aren’t in season right now but peaches are I thought I’d substitute. I tried the marrow beans in this recipe; since they seemed to resemble the cannellini beans more than the flageolet. I also added slightly more cinnamon than Lidia called for and some fresh grated nutmeg. I did everything else the same. As I was cooking the mixture I noticed that it was starting to take on the appearance of chunky applesauce; so I decided to switch it from a soup to a side dish. I served the finished product with some grilled pork chops and loved it. 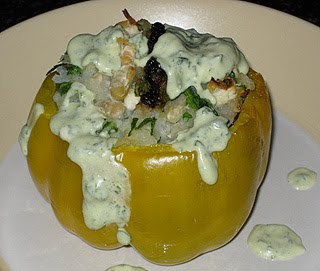 Recipe #2 Risotto and Bean Stuffed Peppers with a Basil Sauce. I came up with this recipe watching Giada on the Food Network. She did something similar using couscous and chick peas. I’m not a huge fan of couscous…but I love risotto so I decided to try that instead. I used the flageolet beans for this recipe because I had read they pair well with basil and lemon. Another change I made: instead of currants I used chopped dried plums. I didn’t use the chicken broth to make my risotto and I also left out the cumin. I followed Giada’s basil sauce recipe exactly but did note that next time I would leave out the sugar. I loved the way this recipe turned out and it was a huge hit with my family. There’s something about the mixture of white beans and tuna that I really love. So I couldn’t resist trying it with my heirloom beans. It turned out delicious. I used the marrow beans and mixed them with the tuna. I added some chopped plums; placed it on top of torn leaves of Boston lettuce and drizzled the entire thing with lemon juice/rind and some good quality olive oil. The beans were fabulous like this. The light dressing really let their taste shine through. Three bean recipes down and still a few days left until the end of June. Thanks Marxfoods for this awesome challenge. Lovely! I love using beans in our meals (such great sources of fiber and protein, not to mention so tasty). I am going to have to try your white beans and tuna combo. Sounds great! These are so creative! I think my favorite so far is the stuffed pepper! Go you. What a fun challenge! You came up with some great ideas. I can go meatless as long as I have a bean! These are all interesting and very creative! Especially the peaches and beans! 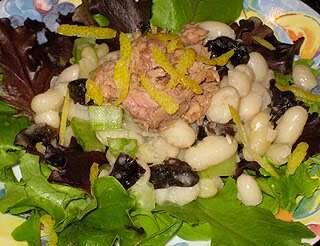 Tuna and beans sounds like a divine combination and makes for a protein-packed lunch. I'm definitely going to try that next week! I'm so amazed at how many varieties of beans there are. It seems bloggers are always bringing a new type I've not heard of to my attention. These recipes look great! What a wonderful challenge and more wonderful is that you took it and did so beautifully. I love the stuffed pepper most of all but each one was creative and tasty looking. Just stopped by to say hi and respond to your question - an old burger post would be fine for the round-up. Hope you have a great weekend! Those are some new beans to me! Thanks for introducing me to them. And well done on your recipes!